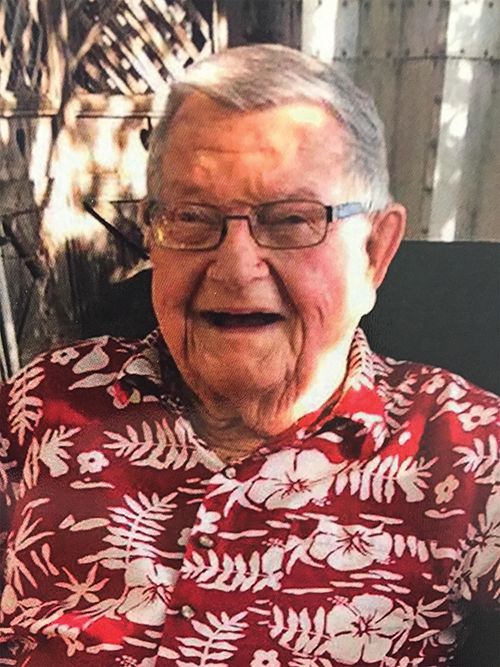 Entering the world on Nov. 25, 1924 in Alhambra, Calif., James Raymond Canterbury, the son of Ray and Laura Canterbury, was raised in the idyllic town of Redlands, Calif. Jim died in comfort on September 24, 2018. His 93 years were full: Redlands High graduate; World War II soldier in Europe, trained in the cavalry on horses; University of Redlands graduate. A 1948 summer job as a pot washer at Sequoia National Park introduced Jim to a lively beauty named Beverley Nielsen. Married in 1950, Jim and Bev eventually settled in San Jose. A popular and beloved English teacher, Jim spent his career as a community college English professor. For Jim and Bev, 1950s San Jose social gatherings centered around their Gourmet Club, Mills Mob events, and dinners with teaching colleagues, always including china, silver, a delectable menu and women in dresses, heels and gloves, and tie-clad men. The Summer of ‘58 was movie-esque for Jim and Bev, spending the entire summer traveling in Europe. In 1959 Jim and Bev’s dream of a family came true, shaping the rest of their lives; 5 kids arrived in 6 ¾ years! Kendel Lee, Darcy Frei, Todd Frisby, Paige Ann, and Courtney Jane were the ever blessed children who, being raised in the 60s & 70s on Culligan Blvd, enjoyed a “Leave it to Beaver” lifestyle that shaped, molded and grounded them into who they are today. “Daddy” became Jim’s beloved and lifelong identity (he did have 4 girls!). His homemaking skills were unparalleled; he and Bev made a remarkable team. Daily egg and toast breakfasts, laundry folding, vacuuming, setting beautiful dinner party tables, faithfully teaching T/Th night classes, playing the piano by ear, taxiing kids to 4-H meetings, and packing the car for Frogger and Huntington Lake vacations were integral events in Daddy’s dedicated life. His ability to outfit Mom and his daughters stylishly, complete with heels and matching accessories, amazed on-lookers. A 1994 move brought Jim and Bev closer to their kids in Visalia, Calif. Seemingly endless memories ensued with their 14 grandchildren and 9 great-grands, until Bev’s passing in 2003. Daddy’s later years included Rescued Treasure Thrift Store finds and subsequent updating of his tidy, warm and welcoming home, watching grandkids and their friends spend countless hours in the pool during hot Valley summers, and ever-anticipated family vacations, all lovingly documented and enthusiastically received on Facebook! As his independent but aging years unfolded, Kendel became Daddy’s roommate, meticulously and graciously tending his needs so he could stay in his beloved home, all of that deeply appreciated by the sibs. Daddy’s simple faith became evident at the end; the family rejoices he is with Jesus. They are looking forward to privately celebrating “The Leader of the Band” next Father’s Day weekend where it all began: Sequoia National Park. Memorials are graciously received by the family to Visalia Rescue Mission, the parent organization of Rescued Treasures. Kendel Christiansen, Dave & Darcy McKenzie, Todd & Kim Canterbury, Jeff & Paige Lien, Dave & Courtney Hengst and their 24 offspring now bathe in the amazing memories of a life so fully lived by a remarkable man they called Daddy. Tributes and condolences may be made a www.millerchapel.com. Arrangements entrusted to Miller Memorial Chapel, 1120 W. Goshen Ave., Visalia, CA (559) 732-8371.